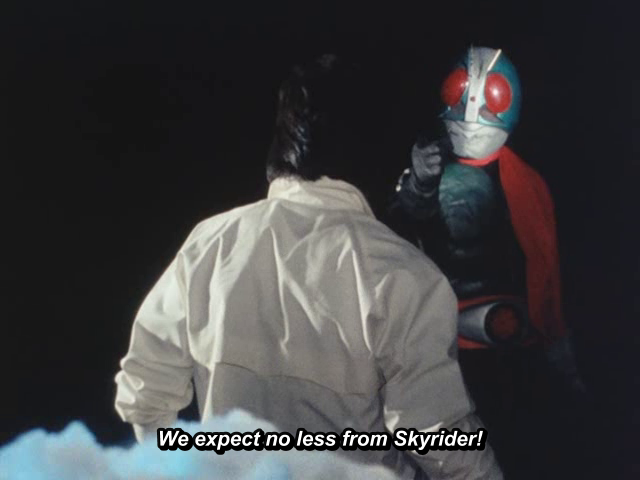 KITsubs: Kamen Rider Skyrider episode 28! Here we are, the end of Skyrider's second arc. The stakes are at their highest as NeoShocker and their 2nd Generation Monster Army are moving to destroy Japan. Last episode, the Legendary Seven Riders came to the aid of Hiroshi just in the nick of time. Now they are entrusting their special training to their new comrade, officially named Skyrider, to defeat GranBazami. This episode will be the last time we see a lot of things. The opening and ending, for one... and this is the last time we see Skyrider's first costume! The new one is... less than impressive. We also get to see the Riders' special training, a sequence that is genuinely one of the best in the series. The whole build up and the training itself is such a cool moment in the series. And it's always great to see all of the Riders team up! I have to apologize again for the extended hiatus. It was all on me. Sky and UK Windom were still around, and I was the one wasting time with all of their hard work on these episodes. Last minute renovations in my apartment caused the delay, this was AFTER the previous renovations. But now everything's done, and the furniture is all moved back in, and things have settled down. No more delays. PS: Please let us know if you need any torrents seeded, scripts reuploaded, etc... But hopefully everything has been running smooth these past few weeks. Thanks for watching! Worth waiting for. Much love from the UK!